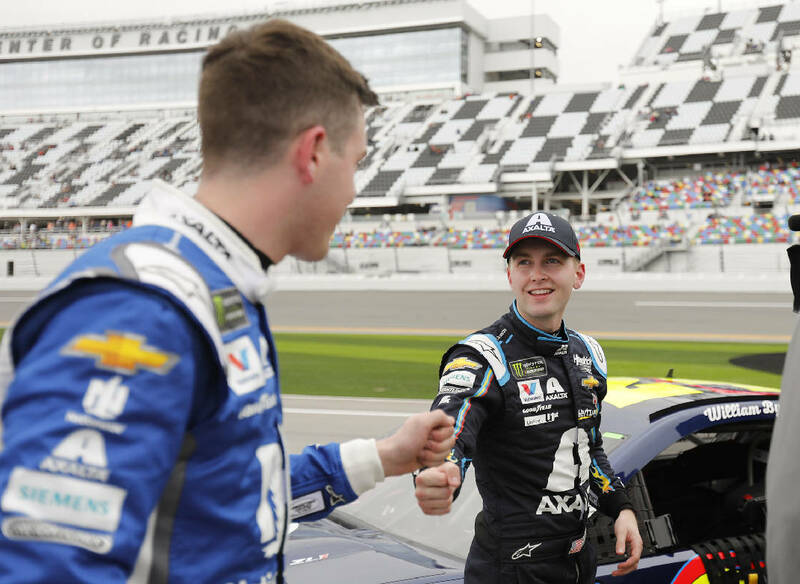 NASCAR Cup Series driver Alex Bowman, left, congratulates Hendrick Motorsports teammate William Byron after their qualifying runs Sunday at Daytona International Speedway. At next Sunday's Daytona 500, Byron will be in pole position and Bowman will join him on the front row of the starting lineup. DAYTONA BEACH, Fla. — William Byron put Hendrick Motorsports in a familiar position — on the pole for the Daytona 500. His bigger goal is to make the starting spot pay dividends for the NASCAR powerhouse. Byron, 21, and Hendrick teammate Alex Bowman, 25, locked in the front row for The Great American Race during qualifying laps Sunday at Daytona International Speedway. They will be the youngest front-row combination in Daytona 500 history. The coveted starting spot hasn't meant much at the NASCAR Cup Series season opener over the past two decades, though. The last driver to start in pole position and win the race was Dale Jarrett in 2000, and the past four pole-sitters — Hendrick's Jeff Gordon, Chase Elliott (twice) and Bowman — have failed to notch a top-10 finish. Team owner Rick Hendrick, however, isn't about to trade the early advantage for next Sunday's race. Byron and Bowman edged the other two Hendrick drivers: seven-time Cup Series champion Jimmie Johnson and fan favorite Elliott. "I think it's huge," the 47-year-old Knaus said. "We've had a lot of late nights, a lot of long hours. The last time I came here with a new driver, we sat on the pole. This is really special for me." The rest of the 40-car lineup will be set by two qualifying races Thursday. Thirty-six of those spots are already filled because of NASCAR's charter system for its top-tier series. Former Hendrick driver Casey Mears and Tyler Reddick secured two of the remaining spots in the Daytona 500. They posted the top speeds of the six drivers competing for four open spots in the opener. Joey Gase, Ryan Truex, Parker Kligerman and Brandan Gaughan likely will have to race their way into the Daytona 500 during the qualifying races. Two of them will make it, and the other two won't. Byron and his teammates will spend this week being lauded as favorites. They will also try to stay out of trouble in the qualifying races. Hendrick has been outspoken about how difficult the 2018 season was for his organization, calling it one of the worst in team history. The Hendrick cars were mediocre at best — Johnson failed to win at least once in a season for the first time in his Cup Series career — and it took 22 races for the organization to get its first victory. The final tally for Hendrick included three wins for Elliott and none of its drivers among the four eligible for the championship in the season finale for the second consecutive year. Later Sunday, Johnson won the Advance Auto Parts Clash, an all-star exhibition to get Speedweeks rolling. For at least one day — and maybe even a week — Hendrick's moves seem to be paying off. "You work all these years coming down here, and you want all the cars to run well," Hendrick said. " This is a tribute to our organization, the engine shop, the chassis-body shop and the teams to come down here and run with four cars running that good. I can't believe it." NASCAR has ejected the car chiefs for Austin Dillon, Ty Dillon and Elliott through the Daytona 500 for repeated inspection failures before qualifying for the race. The drivers also were docked 15 minutes from the final Cup Series practice before next Sunday's race. NASCAR has cracked down this season on inspection failures and will disqualify race-winning cars shown to have violated regulations. Greg Ebert for Austin Dillon, Billy Plourde for Ty Dillon and Josh Kirk for Elliott will not be allowed to return to the garage until the season's second race, Feb. 24 at Atlanta Motor Speedway. Austin Dillon won the Daytona 500 for Richard Childress Racing last season. Ty Dillon, his younger brother, competes for Germain Racing.